In other words, the Griffins’ had planned it this way – so what’s your problem? The problem is that this is the latest in a long line of instances of cherry picking the 1911 – 1919 visions and planning that Marion Mahony and Walter Burley Griffin had for the new national capital. 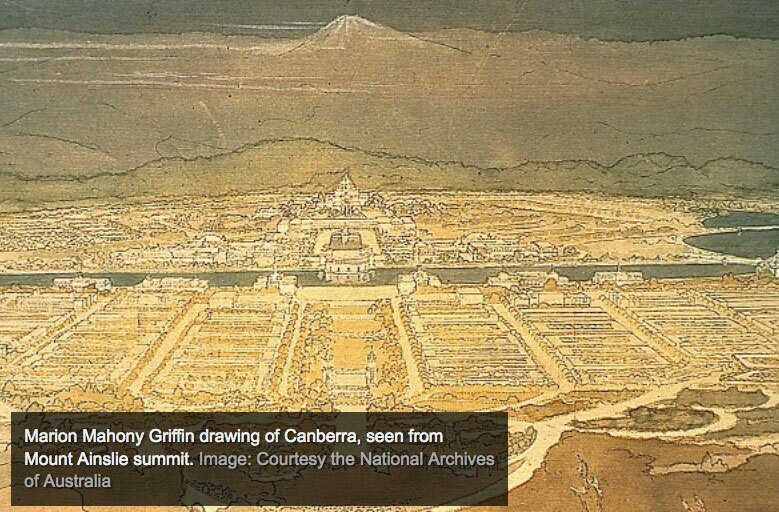 The story of the Griffins is entwined with the history of Canberra. 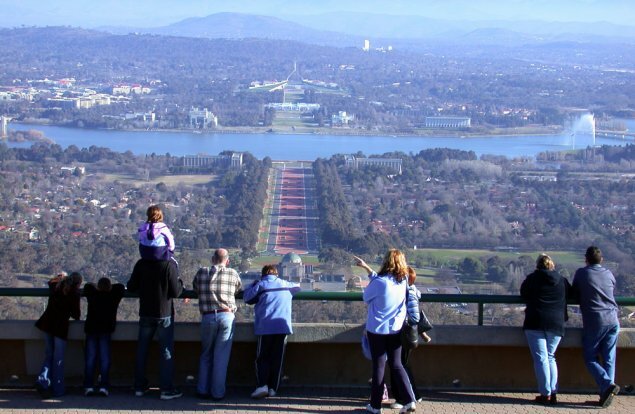 How much of Canberra as we know it today is still linked to their visions remains a very contentious debate. Some of the basics remain – the lake, some of the placement of buildings, parks, open spaces, mountains, and particular site lines but not a lot more. Many bureaucrats have driven the development of Canberra and at times they have evoked some notion of a link to the Griffins and their legacy. In the 1950s – 60s the bureaucracy somehow managed to translate the Griffin plans to mean that Canberra was a city for cars. The reality was that this was in response to the Big Oil push internationally that everything should be driven by petrol. This was the time when so many cities lost their growing public transport systems – eg when Sydney lost its trams. Hence the major part of the planning was for a complex of freeways across Canberra. Luckily most of this was not delivered. But it did mean that the city was designed for cars rather than having a network of public transport. That was the time when they should have been installing trams. When the bureaucrats who presented at the West Basin meeting made reference to the Griffins, most of the time they meant the “Griffin Legacy’ document. This is not a Walter and Marion document but a 2004 National Capital Authority (NCA) book. I could spend heaps of time explaining the document and its purpose. Here’s the short version. It is a well-designed and well-researched document that has one aim – to encourage a development in areas of land then under the care of the NCA. The Griffin Legacy is a plan that suits Big Development – it does little for the people of Canberra. There are some reasonable ideas mentioned – but these are put forward in the context of promoting ‘Big Development’. Whereas the Griffins never moved beyond the theoretical stage of designing for a early 20th Century city. They were not designing for the world of cars as we use them today, for modern housing, to address climate change, 21st century sustainability concerns and the health and well being issues brought about 21st century life-styles. Here’s another recent example of cherry-picking the Griffins’ vision. One of the events for the Centenary of Canberra was an architecture run competition titled ‘CapiThetical’ – one of the dumbest titles a committee has come up with. Here’s the thing. I was present when it was explained to a senior Centenary staff member how another organisation was thinking about a competition for designers to put themselves into the Griffins thinking – to think along the lines they did – and to imagine how the Griffins would deal with the 21st century Canberra. That is, accept for better or whatever what has happened so far. And then apply a Griffin vision to the design and planning for this city for the 21st century – and how to deal with the current issues of climate, housing, transport, equity, sustainability etc. Sadly that consultant took the idea and – yes – it was then misused without any recognition. The next thing we knew was that a version of the competition was to be run by architects and with that silly title. The concept was for architectural designers to come up with a concept for a theoretical capital. The spin mentioned the Griffins but nothing about staying within their vision. But let’s get real –we did not need a theoretical design for a ‘new’ capital – and this was paid for by this ACT Government. And guess what won? The specialist jury awarded the prize to a firm that designed a new capital in the north of WA. You should have seen the look on then Chief Minister’s face when this was announced. She just did not know how to react. And it was all done with spin that this was in the spirit of the Griffins. Some of us just walked out as soon as we could, laughed and said the obvious – What were they thinking? But hey – that’s what architects do well – ignore the issues. They had, like others before and since, cherry-picked from the work of Marion Mahony and Walter Burley Griffin. So be wary of bureaucrats who quote the Griffins and even more, be very wary of bureaucrats who quote the Griffin Legacy – which is their own work that has cherry-picked the Griffins’ work to suit ‘Big Development’ – but not residents. And lastly be wary of ‘specialist’ juries when it comes to awards and competitions! I have many stories to tell about some of those – but that would cost you a coffee at Dickson – where the coffee is good.